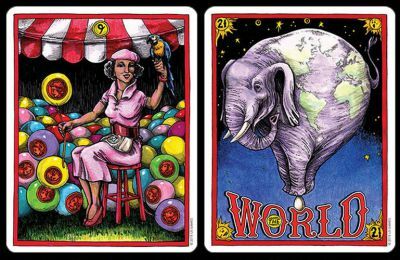 One of the latest tarot published by U.S. Games is about the circus archetypes. It has been designed by Joe Lee (joeleeillustrator.com), a former professional clown who currently lives and works as an illustrator. All the cards show everyday scenes from life under the big top and its sideshows. The suit of Cups is for the world of performance. The Swords are embedded deep in the bizarre and frightening heart of the sideshow. The Coins represent the business and the Wands conjure the backbreaking work of man and animal to raise the tent. The colourful illustrations are in the style of vintage circus posters and of course, they try to follow the Rider-Waite-Smith pattern. The 60-page companion booklet contains some paragraphs about the circus life and the different characters. Price and where to find: The regular price for one pack is US$ 22.